@David - very nice. The Bryce part will be the easy one. Some great renders and models and UV mapping going on... Wonderful Brycers. Here's my latest Bryce render. I called it done around contest deadline time, but now that the contest is over I'm considering one or two additional tweaks. I think that white spot on one of the dragon's eye ridges is super-distracting, and the head of one of them on the roof looks a bit odd. The distant castle walls also seem a bit artificial, maybe some grunge in the texture will help? Not sure if there's room in the scene for another texture though, I'm cutting it pretty close. Anything else I should consider adjusting? @David: Thanks. Top and bottom edge doesn't look quite right, but I'll still stick a fork in that particular image. Your almost finished structure looks like a fish and chips shack. It's really coming along. @mermaid: Love the abstracts. The last one is really interesting. I copied the tutorial at the link and will give it a try. What I meant was I put the flame in a reflective cube. As usual it didn't come out as I'd hoped. But they looked nice none the less. @Dave: Love that image. 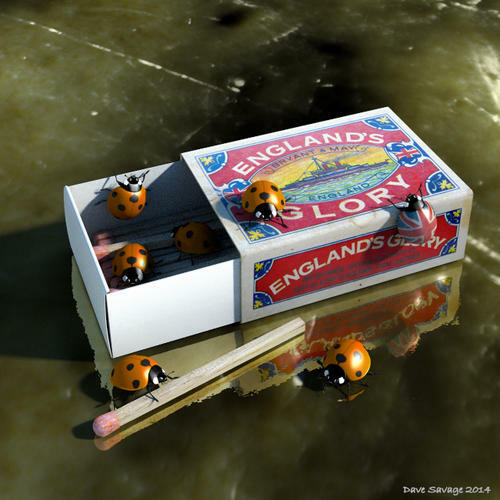 The lady bugs are a nice touch, especially the one with the Union Jack shell. @Sean: Real nice scene. Took me a minute to realize the two deer were statues on either side of that tower. Big suckers. Guss- thanks. 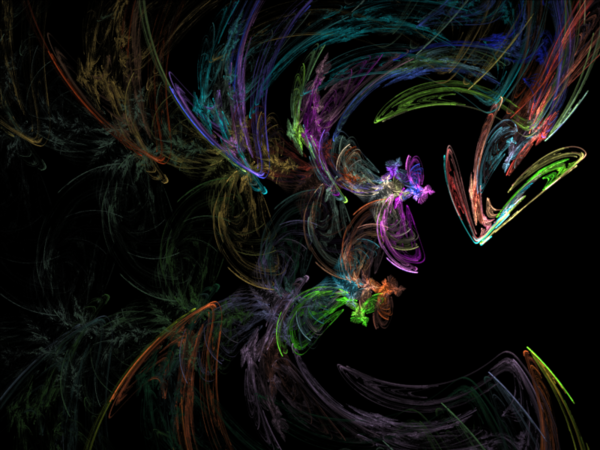 I downloaded all the pdfs from the tutorial site on Friday so I could play with this program on over the weekend. I’m really dumb as I still don’t understand how you used the flame. Did you import it into Bryce, or use it on a 2D or a terrain or sphere etc? I don’t see any option to import the flame. I also put the flame in a reflective cube but I used a 2D face to bring the flame into Bryce. 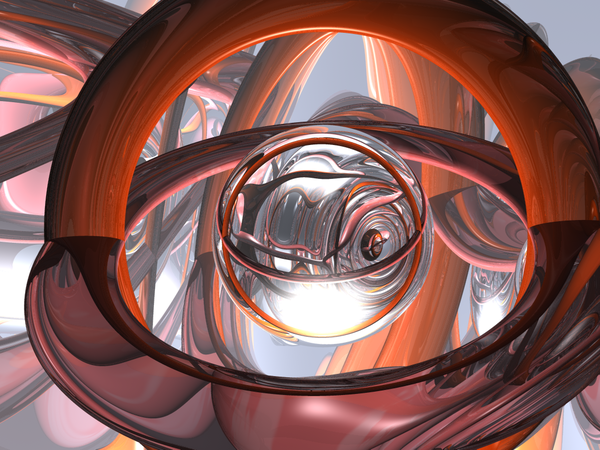 Here’s another version the flame wrapped around a sphere. No need for a modelling programme... Photoshop is your friend (other photo editing programmes are available). But even using a top and side view render of the match box sleeve in Bryce you could create a basic UV map in photoshop, Edit the text and map it back on to the model component or at least create an oversticker type thing in Bryce. @mermaid: You are exactly where I was until I found, and watched, this You Tube JDWildfire Tutorial. Tera Cowles explains JDWildfire in simple terms to get anyone interested in the program up and running very quickly. I think once a person gets the hang of the controls, some mighty fine flames can be created. @mermaid: You're welcome. And thank you for the link to those abstracts on deviantart. I got lost in thought all afternoon. Below are a few of the abstracts I did following the tuts mermaid linked to on deviantart. 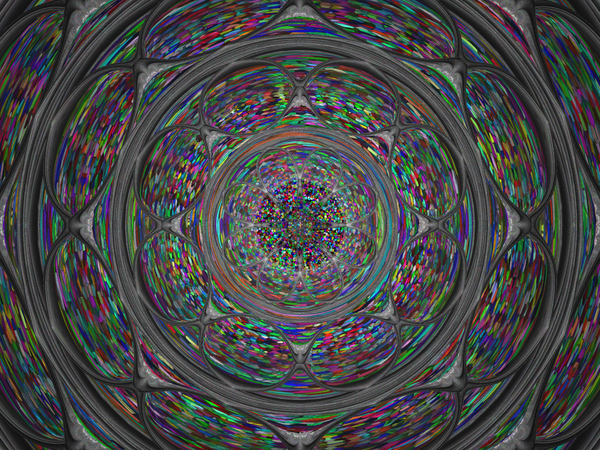 I rendered one, brought it into Bryce using a 2D Face and then placed it in a reflective cube and this is the result… the last one. I come to you - hat in hand - hoping you can help. I followed that tutorial on Deviant Art exactly, apart from one item. Where is says "Position the moon dead centre at the bottom." I reckon that must be my problem because I have a dead black screen when I render and that's the only difference I can find. @fran: I've provided two images, below. 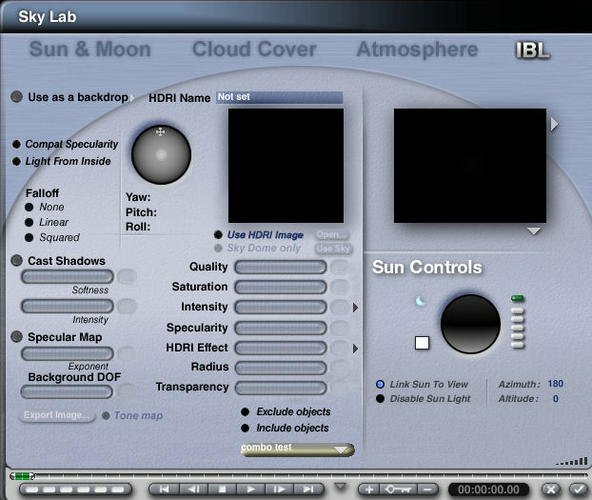 The first shows the Sky Lab selected and the Sun icon showing. 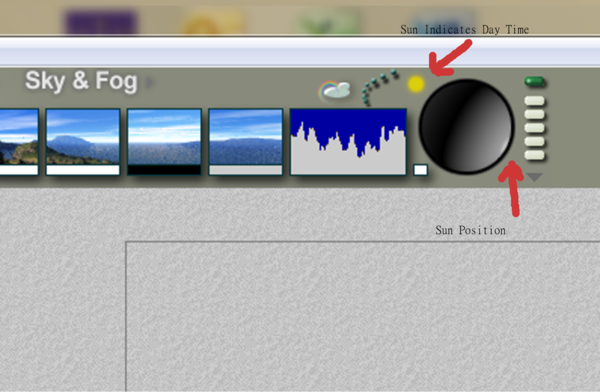 If you look at the roller ball and look at the bright dot on the bottom right, that's the sun position. 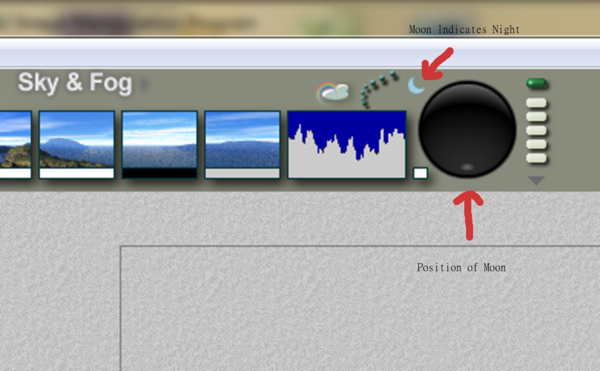 Now, if you move the roller ball so the sun dot disappears, you get the Moon icon, the second image. The darker dot, sort of blueish, shows the position of the Moon. As you see in the second image, the moon is centered at the bottom. This is where the moon should be for that tutorial. Hope this helps. 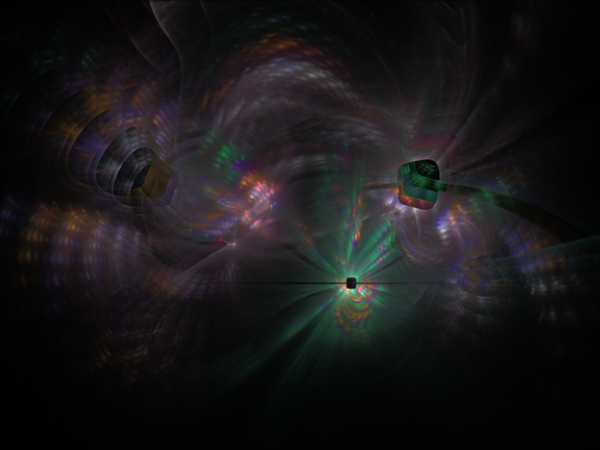 Played around with JDWildfire at bit more, and did the following from scratch. 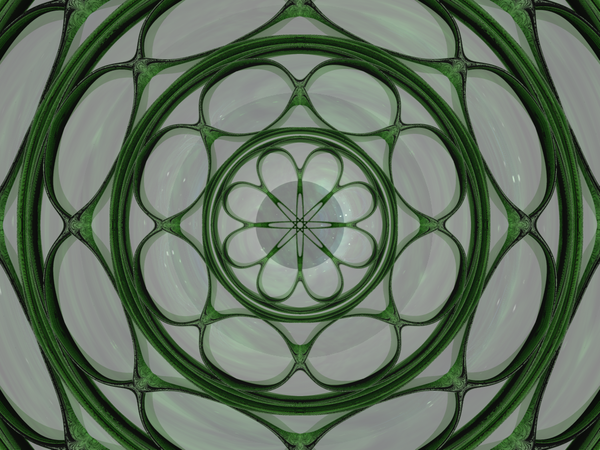 It started as a not so pleasant green, so I used the randomize color button to get what you see. JDWildfire also has a neat feature which allows you to create iterations from the original flame, which is where the next images came from. Fran- I take a much easier route ---in the sky lab type 180 for Azimuth and 0 for altitude. ;) moon dead center. Oh is that what it meant! Hmmm, it wasn't that then. I've still got just black. To me, logic says no light will show with a camera positioned above the ground plane, and that's exactly what I've got. No light. Plus, why does it matter where the moon is positioned if the moon is off anyway??? Did as you said and I STILL get black. (see sky lab pic) Lol. Fran - I'm sure there must be something else that is wrong. This is one of the easiest tutorials I did. Edit: The light sources should be above the ground plane. I remember changing the positions. 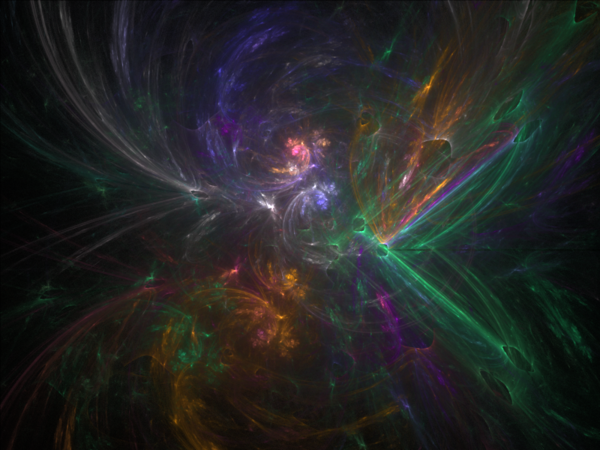 Guss...that second one is gorgeous...almost 'nebulae-like' - have made it my next wallpaper. I change wallpapers regularly on a weekly basis, so a welcome always in viewing the unusual is a surprise. It's not a light but a material problem. 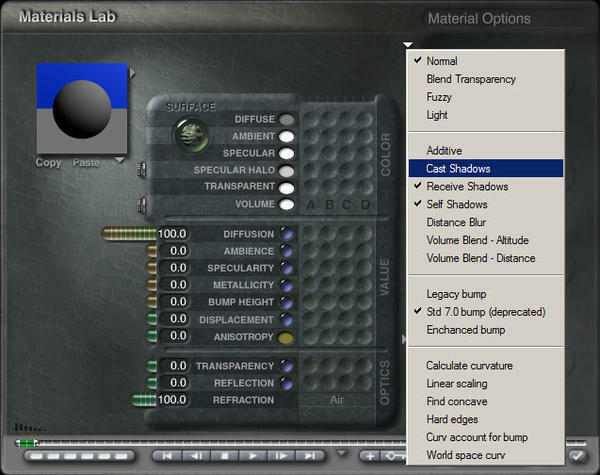 In the Materials Lab for the ground plane, disable Cast Shadows in the Materials Options. 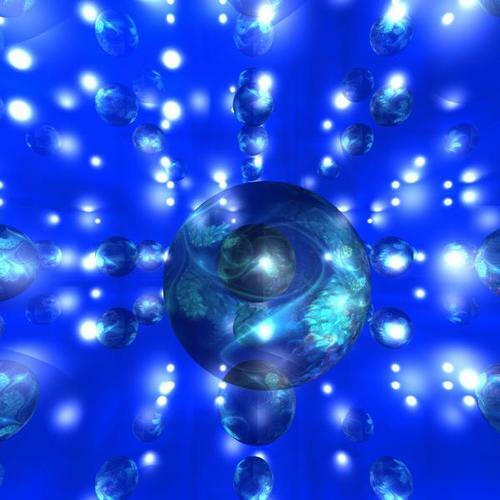 Then, light travels through an object. The preview shows that the shadow disappears. In this way, you can also light light the interior of a cube. @Dave - cute idea with the ladybugs. 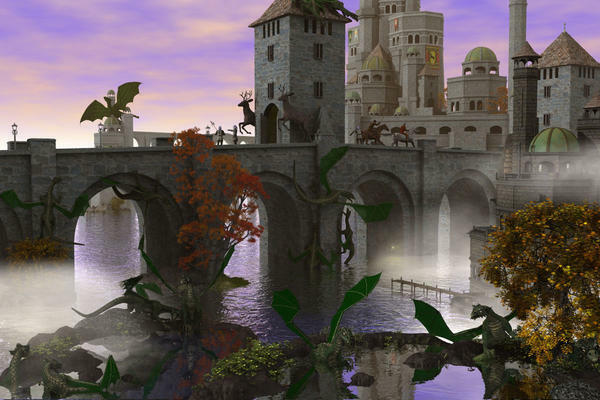 @Sean Riesch - this is a very elaborate scene. It's fantasy so it's the artist that decides when it is done. If it were a photo-realistic render, I'd suggest to make the sky more blue. 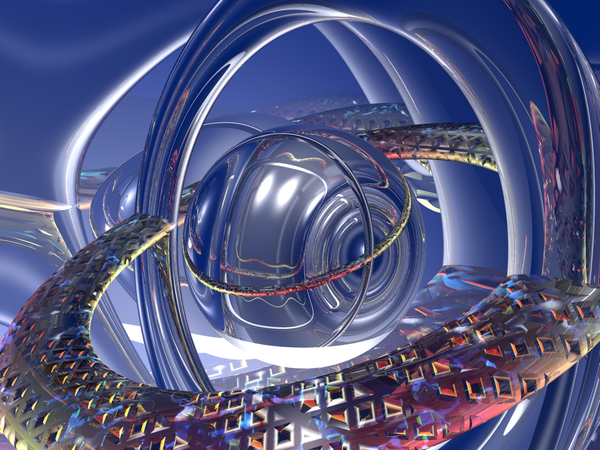 @mermaid010 - nice blue render. @GussNemo - these abstracts, the first is just beautiful and the second also. The third is a bit busy and the fourth a bit empty. The JDWildfire abstracts look good, too, I like the third one most. That gave me an infinitesimal amount of very feeble grey light. Nothing like any of the renders I've seen. Unfortunately that didn't help either. But looking at the scene from a side view I realised what was wrong when I did 'Camera to Director' because then I could see that the upper plane was blocking the camera's view. So I lowered it. And then I finally got colours, but pretty feeble. I tried using a texture on the column... but that just dulled things down even more - yuk! Then I moved one of the lights even higher, and higher and higher. If it works I'll post it. If not, it's back to the drawing board. So it was neither a light nor a material problem, just a camera problem. Glad you could sort it out. 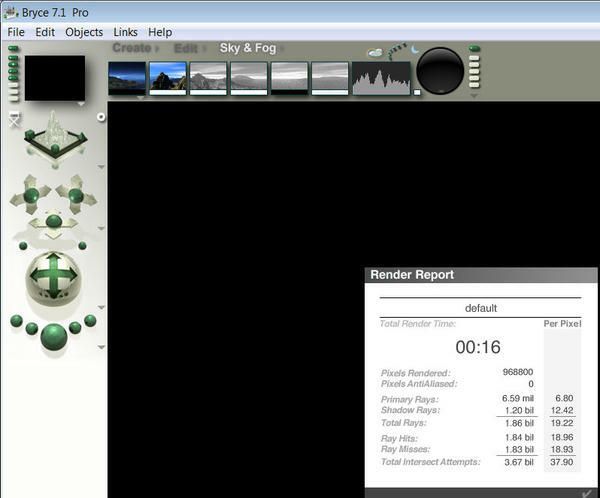 Okay, in that tutorial the two radial lights are placed at Y:-70 and Y:-50, which is below the default ground plane. The radial light which is at Y: -50 is to have diffuse and specular set to -12. Material for the default ground plane, the second ground plane, the sphere below the second ground plane, and the cylinder use Silver, Brushed (Metals --> Precious --> 2nd row, second material). As to why the moon needs to be set at the center very bottom position I haven't a clue. But if it's not you don't get any light into the cylinder. @fran: I wondered that very same thing, since both radial lights are below the bottom of the cylinder. And nothing was said in the tut about changing any Material Options in the Mat Lab. If you still can't get light, Horo may be right in unchecking Cast Shadows in the Material Options in the Mat Lab. Also, play with the diffuse and specular settings for the radial light at Y: -70. Depending on the material used, you may have to crank both quite high. @Jay: Thanks. And please, feel free to use it. That one happens to be one of the iterations of the first image posted. When the mutation button is pressed, I think there's something like 30 iterations displayed in a separate window. Thanks all I've done a different version of it with some depth of field and the Union Jack bug moved so he shows up better, but I'm not sure it's done yet so I moved onto another render for a job I'm on with. 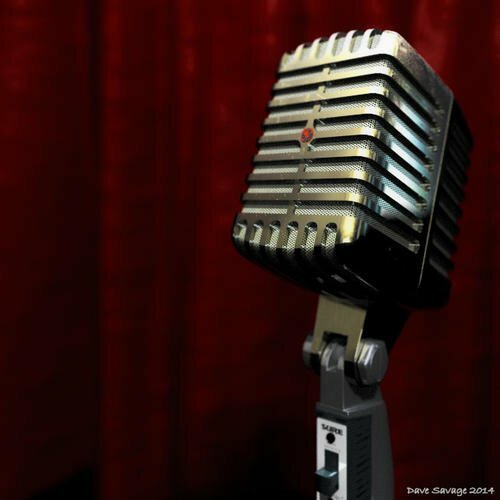 As to my latest job, it's the background pic for a CD album cover for some friends of mine who have a band playing 1950's Rock 'n' Roll. This is just an initial idea I had for them and may not be the chosen design. @Dave - curtain looks great. The mike as well, of course. I don't know this Sure model, the ones I know are a bit rounder. But whatever, it looks photo real. Great job. Wish the band all success, I've always been a fan of that sort of music. Savage...lighting on the mic is great, too. Well... Without the change in camera position nothing helped, once the camera's position was sorted out the other things did make a difference, and changing the lights' positions helped a lot. I'm now rendering... the last run took all night, I hope this one will be finished before bed tonight, as it's quite hot in the bedroom with the PC running all night! Lol. So thanks to both you, Horo, and to Mermaid. I have another idea for a further adjustment but I just want to see how this one goes first. Great model and render Dave! 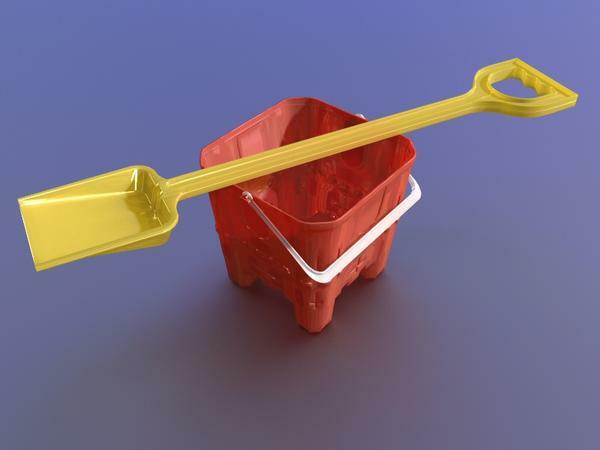 Don't ask how long it took to model a bucket and spade... Really it is harder than I thought. Modeled in Wings 3D rendered in Bryce.